3 Bedroom Semi Detached House For Sale in Mansfield for Asking Price £160,000. DECEPTIVE PROPERTY . . . RE-FITTED KITCHEN . . . CONSERVATORY . . . LANDSCAPED GARDEN. 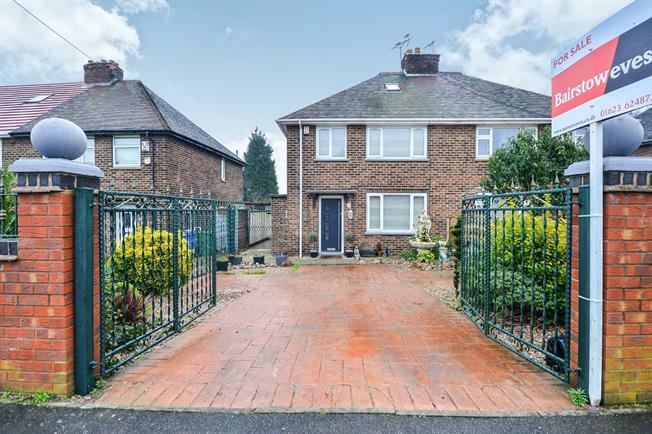 The accommodation of this gorgeous home comprises an entrance hallway, cosy lounge, re-fitted kitchen-diner with utility room and WC and a conservatory. To the first floor there are three good sized bedrooms and the family bathroom, there is a further staircase which leads to the attic room. Outside of the property is a driveway with gated access and a wow factor landscaped garden to the rear. A composite front door gives access with stairs to first floor, radiator and double glazed window to the side. Double glazed window facing the front and wall mounted radiator. The heart of the home - this gorgeous re-fit comprises a range of wall and base mounted units with roll top work surfaces over, inset sink with drainer and integrated appliances include oven, hob, extractor fan and dishwasher. There is a double glazed window to the rear, composite back door and sliding patio doors into the conservatory. With radiator and patio doors opening onto the garden. Double glazed window to the side and space for washing machine and tumble dryer. With a double glazed window, low level WC and a wash hand basin. The white three piece suite comprises a low level WC, panelled bath with shower over and a pedestal wash hand basin. There is a double glazed window to the rear and a radiator. With two Velux windows and a radiator.